Parietaria Linn., Sp. Pl. 1052. 1753. Gen.Pl. ed.5.1152.1754; Benth. & Hook.f., Gen.Pl.3:392.1880; Boiss., Fl. Orient.4:1149. 1879; Hook.f., Fl.Brit. Ind.5 :592. 1885; Hutch., Gen.Fl. Pl.2:193.1967. Annual or perennial, polygamous herbs, often with uncinate hairs. Leaves 3-costate, exstipulate, alternate, entire. Inflorescence of 3-many flowered-small, axillary, bracteate cymes or in involucrate clusters with intermixed bisexual and unisexual flowers or only bisexual flowers. Calyx deeply (3-)4-lobed in male and hermaphrodite flowers; tubular and shallowly lobed in female flowers. Stamens as many as calyx lobes. Ovary free from calyx, ovule orthotropous, basal; style present or absent, stigma desely penicillate deciduous; pistillode globose in male flowers. Achene compressed, ovate, enveloped by calyx. A genus of c. 30 species, distributed in temperate and tropical countries. Parietaria debilis Forst.f. = Parietaria lusitanica Linn. Parietaria lusitanica subsp. chersonensis (Lang) Chrtek = Parietaria lusitanica Linn. Parietaria micrantha Ledeb. 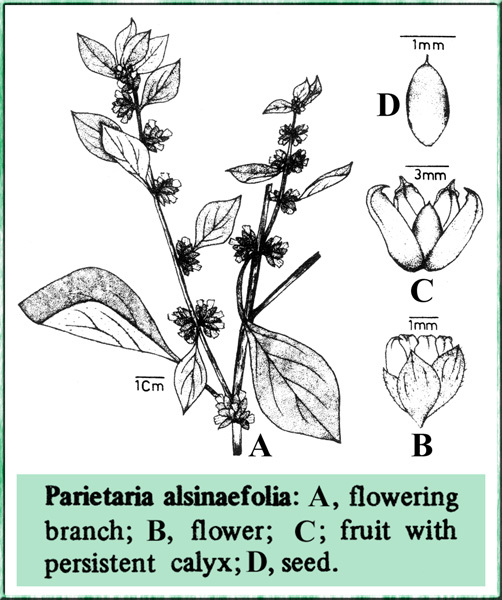 = Parietaria lusitanica Linn. Parietaria officinalis subsp. judaica (Linn.) Beguinot = Parietaria judaica Linn. Parietaria ramiflora Moench = Parietaria judaica Linn.